Sometimes, it is difficult even for experienced birdwatchers to see whether a bird belongs to a certain species; or to another, closely related species. 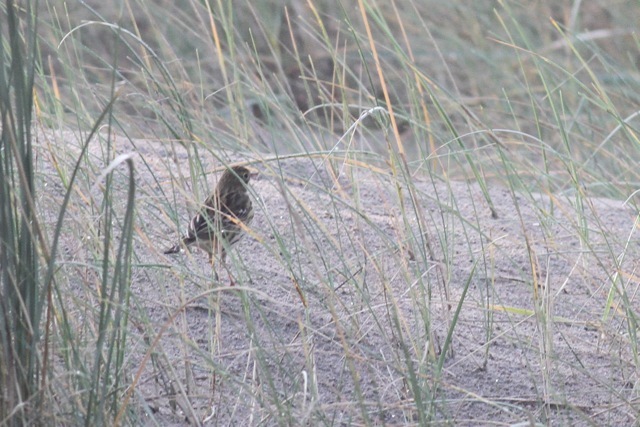 Here we have a photo, 20 October 2013, of a pipit on a sand dune near the southern jetty of IJmuiden in the Netherlands. Is this is a meadow pipit? Or a rock pipit? As most photos show rock pipits as having dark legs, and this photo shows a bird with pinkish legs: one might think: meadow pipit. However, on some photos, some rock pipits have pinkish legs as well … Rock pipits are specialized birds of coastal habitats like there in IJmuiden … but meadow pipits come there as well. So, not an easy issue, meadow pipit or rock pipit.